Why is my chapter 13 payment higher than my neighbor’s? First off, stop comparing yourself to your neighbors. It’s never a good idea to keep up with the Joneses. Your payment might be higher because you make more money, because you owe more on mortgage arrears and car payments, or maybe because you have more assets free and clear. She and her husband were above median with no kids and no car payments. They owned his fairly new truck free and clear, had a some quad runners, and a boat, all with no liens. She did not like my answer that she would have to pay the equity (value) of those things to her creditors or risk losing the truck, the quads, and the boat. Even worse, with their income, they may have to pay a higher payment based on calculations we run comparing them with the Utah median income figures. So your payment may be higher. 1. Higher income — if you make decent money, then you will have to present some kind of repayment plan to your creditors in most cases. 2. Higher mortgage arrears or car payments — if you owe more on secured collateral that you want to keep, you have to pay more money than your neighbor who isn’t making those payments. 3. You own toys free and clear — if you own a boat, or 4-wheelers, or even have too much equity in your home or vehicles, you may have to present a payment plan to protect the value of the items I cannot protect. This entry was posted in Utah Bankruptcy on October 31, 2014 by robertspaynelaw. 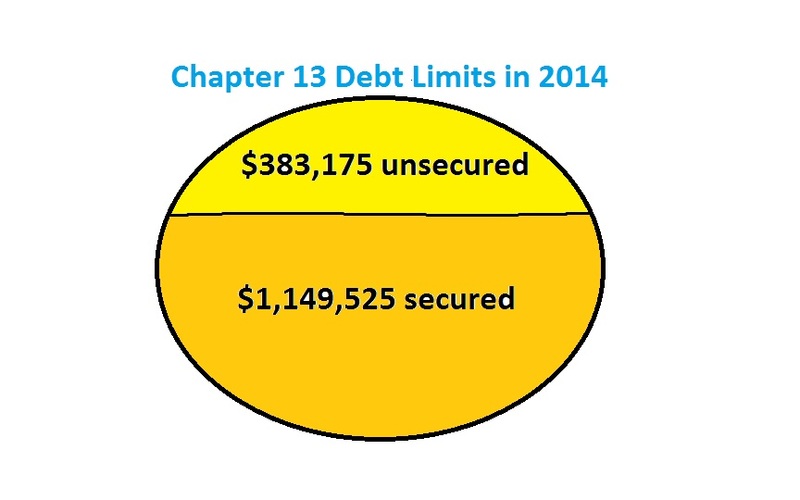 What are the current debt limits for a chapter 13 bankruptcy in 2014? 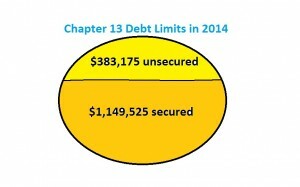 There are no debt limits for a chapter 7. If you don’t qualify for a chapter 7 and owe too much for a chapter 13, you will need to call a chapter 11 bankruptcy attorney. (Not me. I don’t do chapter 11 cases). But the numbers have an automatic inflation adjustment of 3%, so the real numbers are the $383k and $1.1 million above. This entry was posted in Utah Bankruptcy on October 30, 2014 by robertspaynelaw. 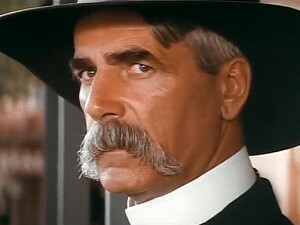 Do you really think that Fu Mancu mustache makes you look like a cowboy? Okay, this isn’t quite a bankruptcy question, but I had a client keep staring at me in court yesterday until they approached me and asked if I was Robert Payne. It is Halloween in two days, and my two year old is a cowboy (a sheriff), and I am a bad guy cowboy that will be taking him out trick-or-treating. I decided it would be fun to drop the clean-cut attorney look for a few weeks and grow out what I thought was an appropriate cowboy ‘stache. Unfortunately, my clients didn’t recognize me. 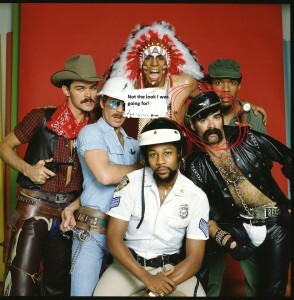 most people have told me that the effect is a little more Biker-Guy from The Village People. So, in answer to the question another attorney asked me after they saw my client’s confusion yesterday, “Yes! 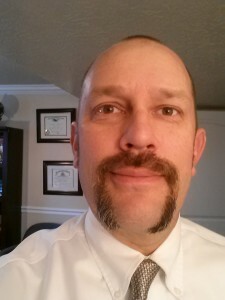 I do think it makes me look like a cowboy.” That being said, I am shaving it off Saturday morning. This entry was posted in Utah Bankruptcy on October 29, 2014 by robertspaynelaw. What happens if I “forget” to list my personal injury lawsuit in my bankruptcy? You may lose the right to ever go to trial or settle that personal injury (“PI”) suit. In bankruptcy, you are required to list every asset you have, including equitable interests and possible and/or pending lawsuits against third parties. If you fail to do so, bad things can happen in your bankruptcy case. 1. The bankruptcy trustee can move to revoke your bankruptcy discharge for fraud, meaning that your bankruptcy case is thrown out and you can NEVER file a chapter 7 on those same debts again. 2. The bankruptcy trustee may decide to pursue the PI suit on your behalf. This sounds great, but if he settles, he may then argue that you didn’t exempt (protect) the settlement, and the money will go to your creditors instead of you! 3. The defendant in your PI suit can move to dismiss the suit against them. Even if you have a very strong case, failure to list the suit in your bankruptcy may give the people you’re suing a nice “out” from the lawsuit. In other words, they “win” even if you have a wonderfully strong case. The seminal case is Oneida Motor Freight, Inc v. United Jersey Bank (3rd Cir. 1988) 848 F.2d 414. In Oneida, the debtor filed a chapter 11 and did not schedule a potential lender liability claim against the bank, nor raise any issue of set-off against the bank’s claim (Id. at 417) and settled, providing for payment to the bank (Id. at 415). The bankruptcy filings failed to disclose the lender liability claim against the bank. Post-confirmation the debtor filed a lender liability against the bank, which the court dismissed on the grounds of estoppel (Id. at 416, fn. 2, and 420). Oneida kicks off a series of cases holding that failure to schedule or disclose the claim (against the tortfeasor) in the bankruptcy constituted judicial estoppel barring any relief. See Billmeyer v. Plaza Bank of Commerce (Cal.App. 6th 1995) 42 Cal.App. 4th 1086, 1092 (fn. 2) (dismissal of lender liability claim for the failure to disclose); Matter of Baudoin (5th Cir. 1993) 981 F.2d 736 (lender liability claim); Hay v. First Interstate Bank of Kalispell, N.A., (9th Cir. 1992) 978 F.2d 555, 557 (lender liability action barred but left open rights of creditors); Ryan Operations G.P. v. Santiam-Midwest Lumber Co. (3rd Cir. 1996) 81 F.3d 355 (estoppel applied in favor of non creditor defendant if the claim was not scheduled); International Engine Parts, Inc. v. Feddersen & Co. (1998) 64 Cal.App. 4th 345 (judicial estoppel in favor of a party who was not a creditor nor a party to the bankruptcy proceeding). Other cases abound: Maggio v. Schatz (Cal. App 2d Dist. 2004) 2004 Cal. App. Unpub. LEXIS 9366 (unscheduled), Hamilton v. Greenwich Investors, XXVI, LLC, (2011) 195 Cal. App. 4th 1602 (unscheduled); Hamilton v. State Farm Fire & Cas. Co. (9th Cir. 2001) 270 F.3d 778, 784-786 (unscheduled); Burnes v. Pemco Aeroplex, Inc. (11th Cir. 2002) 291 F.3d 1282, 1287-1288 (unscheduled). See also M & M Foods, Inc. v. Pacific Amer. Fish Co. (2011) 196 Cal. App. 4th 554, 561-565 (denied confirmation of arbitration award because debtor failed to fully disclose asset in schedules). Not every personal injury plaintiff crumples and some survive the debacle of the unscheduled PI lawsuit. See e.g., Cloud, supra. (possibly holding barred summary disposition at pleading stage: “[N]on-disclosure, and nothing more, is all that could be established in this case by a review limited to the plaintiff’s complaint plus her bankruptcy filings.” (Cloud at 1019-1020, questioning whether non-disclosure was part of a scheme to defraud or innocent error); also Gottlieb v. Kest (Cal. App. 2d 2006) 141 Cal App. 4th 110 (bankruptcy proceeding did not adjudicate the claim one way or another). Dismissal is not preordained but the trustee captures an asset, possibly free of trial counsel absent a valid pre-petition lien. An unscheduled asset belongs to the trustee who may pursue the action for the benefit of the estate. Locapo vs. Colsia (D.N.H. 2009) 609 F. Supp.2d 156, GE HFS Holdings, Inc. v. International Ins. Group (D. Ma, May 29, 2008) LTC 2008 U.S. Dist LEXIS 4406, Graupner v. Town of Brookfield (D. Ma. 2006) 450 F. Supp.2d 119, Vidal v. Doral Bank Corp., (D.P.R. 2005) 363 F. Supp.2d 12. While the claim is preserved, the plaintiff’s standing is forfeited. In any event, the PI lawsuit belongs to the trustee who might oust trial counsel who embraces Fracasee v. Brent (1972) 6 Cal. 3d 784 (measure of attorney’s fees due discharged attorney in tort case). 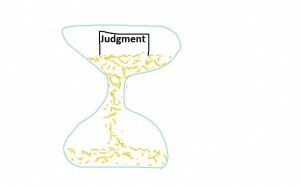 Worse, the plaintiff’s omission is act of dishonesty gives the defense counsel a WMD: “Did you lie on the bankruptcy schedules?” or “Did you lie in this case?” or “Are you cheating your own doctor who saved your life?” The failure to list the PI lawsuit might bar the debtor’s discharge under Bankr. C. § 727(a)(4)(A) et seq. See In Re Harris (Bankr. D. N.H. 2006) 2006 B.N.H. 26; Saunders Real Estate Corp. v. Pearlman (In re Pearlman) (Bankr. D.R.I. 2009) 413 B.R. 27. The failure to list the PI lawsuit may deny viable exemptions. See In re Orlando (Bankr. D. Mass. 2007) 359 B.R. 395; In re Salvucci (Bankr. D. Mass, 2006) 339 B.R. 279. The nightmare culminates in a criminal prosecution under 18 U.S.C. §§ 152 (1),(2) and (3)[false oath]. This entry was posted in Utah Bankruptcy on October 28, 2014 by robertspaynelaw. All of our assets are in my wife’s name. 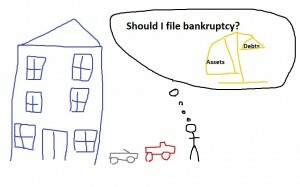 Am I okay to file bankruptcy? Probably not, unless you are recently married, have lots of secured debt, or have inherited property. On the day we file bankruptcy, we list all of your personal and real property. If you are married, we try to list whether you have an equitable interest in any of her property. (An equitable interest means that it is only “fair” that you own half of the property). If you have property that you’ve acquired together though-out your marriage, then it’s fairly easy to claim that it is only fair for you to own 50% of that property. Married for years with property free and clear… So, let’s say that you’ve been married for 30 years. You own a home worth $150,000 free and clear. You put the house in her name only, even though you’ve made every mortgage payment. If we filed bankruptcy, the trustee would argue (successfully) that you owned half of the house. He would then demand that you fork over $75,000 to protect the home or allow him to sell it and use your half of the proceeds to pay off your creditors. Since your name isn’t on title, you couldn’t even claim the $30,000 Utah homestead exemption. Married for years with secured loans… Now what if all of the assets are in her name, but they are all liened to the hilt (you owe more on the car loans and the mortgage than the properties are worth)? In this case, you’re okay. None of the property has any real liquid value, and you can file bankruptcy. Recently married… Now what if you’re recently married? In this case, any property you brought into the marriage is solely yours, so long as your name is the only one on title. Any property she brought into the marriage is solely hers. 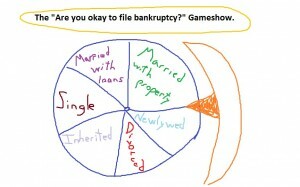 You are safe to file bankruptcy here. Inherited property… Now what if you’ve been married for 30 years, but she inherited a lake cabin solely in her name from her parents? Inherited property is solely hers, and you are safe to file bankruptcy. This entry was posted in Utah Bankruptcy on October 27, 2014 by robertspaynelaw. I need to file bankruptcy now but my attorney wants me to wait for my tax refund. 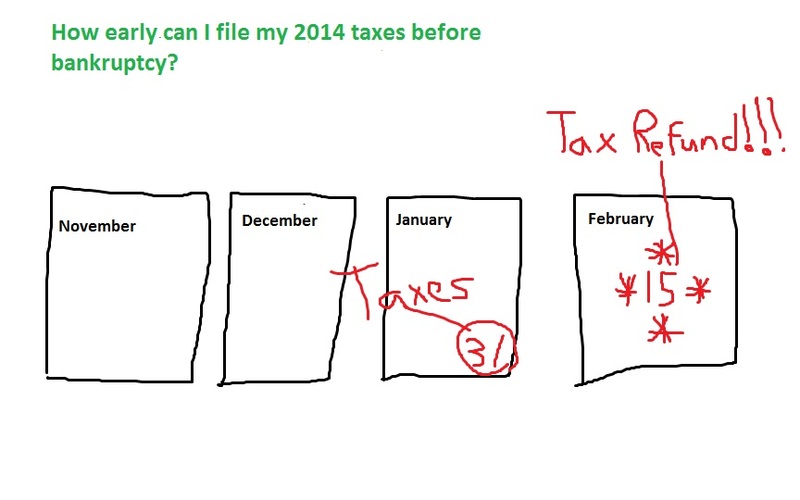 How early can I file my 2014 taxes? Probably January 31st of next year. According to a US News and World Report article last year, the IRS was keeping the earliest tax filing date at January 31st. 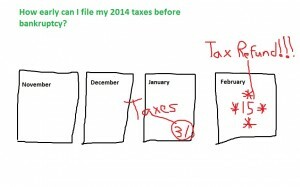 “5 Reasons to File Your Taxes Early.” Most refunds take 14-21 days to process and come back to you. I have discussed the tax refund issue with the various links below (and many more you can find by running the search button on the right), but basically, you want to file your taxes, get your refund back, and spend it on exempt (protected) items, and then go bankrupt. How do I spend my tax refund before I file bankruptcy? Can I use my tax refund to pay for bankruptcy? Does a tax refund anticipation loan through HR Block protect my tax refund from a bankruptcy trustee? This entry was posted in Utah Bankruptcy on October 24, 2014 by robertspaynelaw. 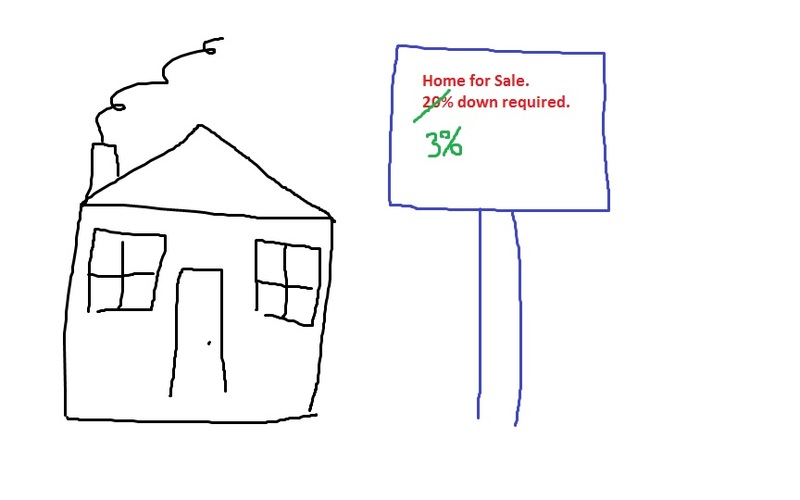 Do I need 3% or 20% down to buy a house after the Dodd-Frank mortgage law? 3%. 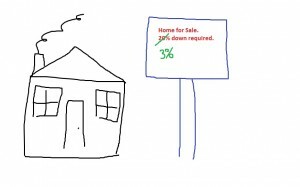 Starting in 2015, recent rule changes may let you buy a home with 3% down instead of the 20% required over the last few years. This isn’t really a bankruptcy question, but I was asked this question last night. Remember that if you are filing bankruptcy and trying to buy a h ome, it will be about 2.5 years until you’ll be able to finance a home with an FHA type loan. This is a different question though. On Monday, Federal Housing Finance Agency Director Mel Watt announced that mortgage-finance companies Fannie Mae and Freddie Mac would start backing loans with down payments as low as 3%. Loans with little to no down payment were a common feature of the lax lending practices that were prevalent during the housing market’s bubble years. This is great news for people who want to buy a home. code of federal regulations,” said Mr. Gallagher. This entry was posted in Utah Bankruptcy on October 23, 2014 by robertspaynelaw. I have enough equity in my home to pay off my creditors. Should I file bankruptcy instead? Honestly, if you have the means to pay your creditors off, then you should do so. Now if that means filing a chapter 13 bankruptcy and proposing a 100% return to your creditors, then yes, you may want to file bankruptcy. In that kind of 100% plan, you freeze the interest rate at 2% and have the ability to pay your creditors off in an orderly fashion. Otherwise, leave bankruptcy for people who have no other option financially. I have had a few phone calls from a gentleman who has $6,000 of credit card debt. He has about $90,000 of equity in his home. He wants to file bankruptcy to get out of those credit card payments. I explained the costs of a chapter 7 or a chapter 13, warned him about the equity in his home, and then recommended that he try taking out a HELOC (home equity line of credit) on his home for $6,000 to pay them off in full. About a week later he called back and wanted to make sure that he couldn’t go bankrupt instead. I explained, again, that he had enough equity to pay off that rather small amount of debt. I can only imagine what Dave Ramsey would have said to this gentleman if he had called in to Dave’s show. This potential client didn’t even need a “debt snowball” plan. [I]t gives to the honest but unfortunate debtor…a new opportunity in life and a clear field for future effort, unhampered by the pressure and discouragement of preexisting debt. Local Loan Co. v. Hunt, 292 U.S. 234, 244 (1934). This goal is accomplished through the bankruptcy discharge, which releases debtors from personal liability from specific debts and prohibits creditors from ever taking any action against the debtor to collect those debts. This entry was posted in Utah Bankruptcy on October 22, 2014 by robertspaynelaw. 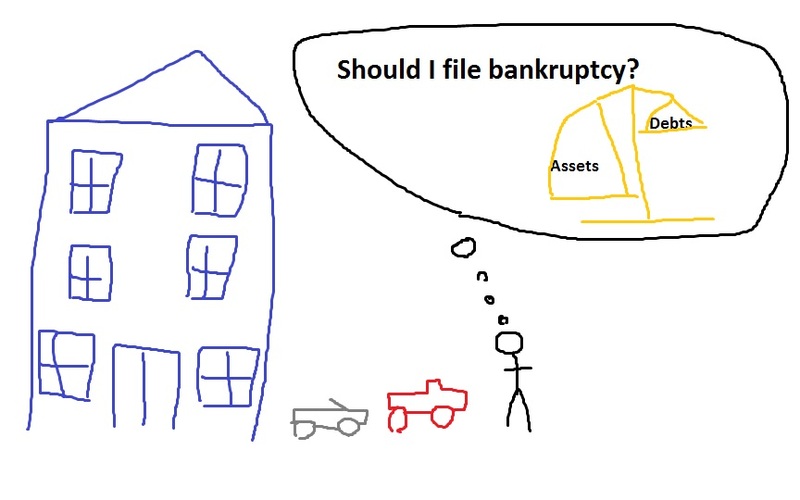 If a creditor already has a judgment against me, is it too late to file bankruptcy? 2. everything else, which can be wiped out, or discharged, by the bankruptcy. I get asked this question over and over, since clients are worried that they dragged their feet for too long before filing bankruptcy. They fear that since there is a state court judgment ordering them to pay their creditors, that the state court judgment will survive anything. Thankfully, they are wrong. That judgment can be listed in the bankruptcy. That being said, judgments do make things more difficult in bankruptcy. With a judgment, a creditor can start garnishing you up until the day you file. They can attach it to your bank or tax refund. They can even attach it to your house as a judgment lien, and then it is a bear to remove, even in bankruptcy. However, just because a creditor has a judgment against you doesn’t mean you’re stuck. Bankruptcy will still take care of it. If you do receive a lawsuit, you should contact your attorney right away to figure out how to handle it. If you don’t have an attorney yet, this would be a good time to call one. This entry was posted in Utah Bankruptcy on October 21, 2014 by robertspaynelaw. I just totalled my car that has a title loan on it. Do I have to give them the insurance payoff check? 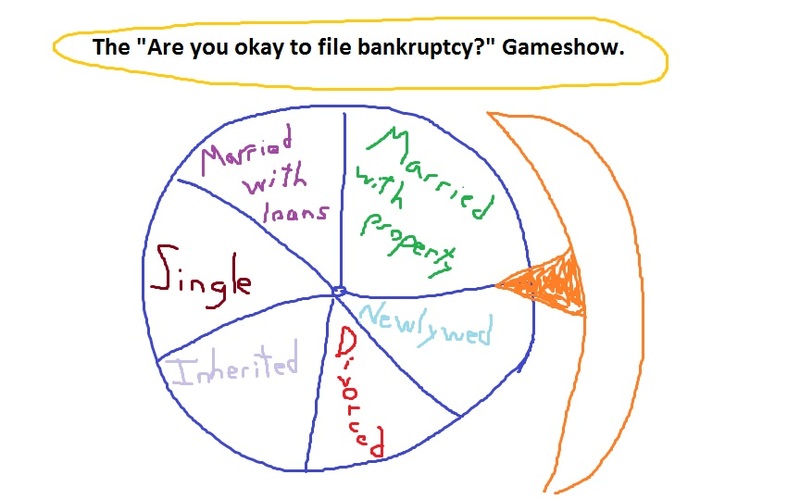 I have a client who filed a chapter 7 bankruptcy. He owned one vehicle with a title loan for about $700 on it. We listed the title loan in the bankruptcy and checked the box that he would reaffirm (keep) the title loan and keep paying on it. Recently, he was in a car accident, it was the other guy’s fault, and my client received a check from the insurance company for $900. The check is written to both my client and the title loan company. They have called and demanded that he turn over the check before they will release the title, and he is trying to settle with them for less than the $700 he owes them. The insurance company knew that it didn’t want to be in the middle of this, so they wrote the check to both parties. The title loan company won’t release the title until they receive the endorsed check, because they are not only the lienholder, but they physically hold the legal title. In this one, my client will lose. He wants to work out a deal, but although the bankruptcy discharged his personal liability on the note, the title loan company still has a valid lien for $700, and they will take $700 of that $900 check. Bankruptcy discharges your personal liability on the secured loan, but the lender still has every right to enforce their rights against the collateral (repossession or foreclosure). If you receive an insurance check, they get to cash it and pay off their valid lien before you see any of the money. This entry was posted in Utah Bankruptcy on October 20, 2014 by robertspaynelaw.